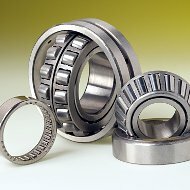 Roller bearings have high radial load capacity and some designs can accept light axial loading. They operate at moderate-to-high speeds. 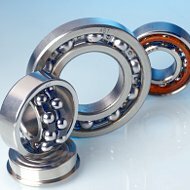 The lubrication method must be carefully considered during the design phase when using roller bearings. 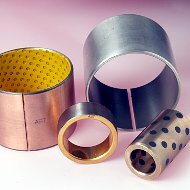 Bushings, or plain bearings, operate with sliding motion between the moving surfaces. Bushings are selected based on the rotating speed and the applied load. Most bushings do not require additional lubrication to operate. 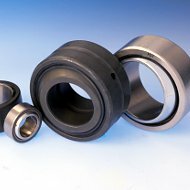 Spherical plain bearings are used for applications requiring rotation and oscillation. The rotation takes place on a sliding surface so the limiting speed is slow. Many styles require regular lubrication, but maintenance free styles are also available. 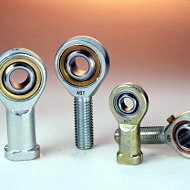 Rod ends consist of a spherical ball mounted in a housing, typically with male or female threads. They allow for oscillation/misalignment during slow rotation. Some rod end types require lubrication, and other types are maintenance free. 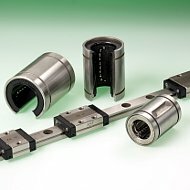 Linear bushing bearings and linear way bearings incorporate several rows of recirculating balls or rollers for low friction, precise linear motion. Linear bushing bearings use a round shaft and linear way bearings have a rectangular shaped track. 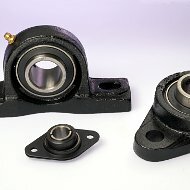 Pillow block bearings, flange bearings and take up bearings consist of a housing with a bearing mounted in it. 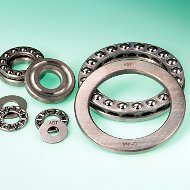 They are available in a wide variety of materials, mounting configurations and various bearing features.